We can observe the sky in many ways: the view is always wonderful, fascinating and exciting. You will be astonished contemplating the stars on a clear winter night, away from city lights, the wonder increases observing the details of the moon with binoculars or the planets with a telescope. These tools, which amplify our visual possibilities, are familiar: who has never had the pleasure of getting close to a telescope’s ocular during an educational evening hold by the local group of astronomers? However, not everyone knows that there are other ways to look at the sky, no less fascinating than the visual. We live in a sea of electromagnetic waves generated by the technology (mobile phones, wireless devices, and television repeaters ....) and from the natural world, with radiation that come from extra-terrestrial space. Every celestial object, from the planets to the farthest galaxies, emit electromagnetic waves: from gamma rays to X-rays, ultra-violet and visible radiation, up to infrared and radio emissions. The human being perceives the emissions in the band of visible because Mother Nature has equipped us with the sense of sight, essential for living, but to "see" other "windows" of the electromagnetic spectrum different tools are needed, each specialized to measure radiation in a certain frequency band. Here we come to radio astronomy, and we'll show you how it is possible to study celestial objects by building and using a radio telescope, an instrument consisting of an antenna and a special radio receiver. We will tell you how these tools are made and how to build one: everyone will be able to experiment with radio astronomy! Undoubtedly it is not trivial to capture the radio of a distant galaxy: the signals are very weak, choked by artificial interference from background noise. To be successful you need a minimum of learning, passion and tenacity. But isn't it true for any activity? We were the first Italian company to offer on the market, in 2000, the RAL10 receiver along with the information needed to build and use an amateur radio telescope. 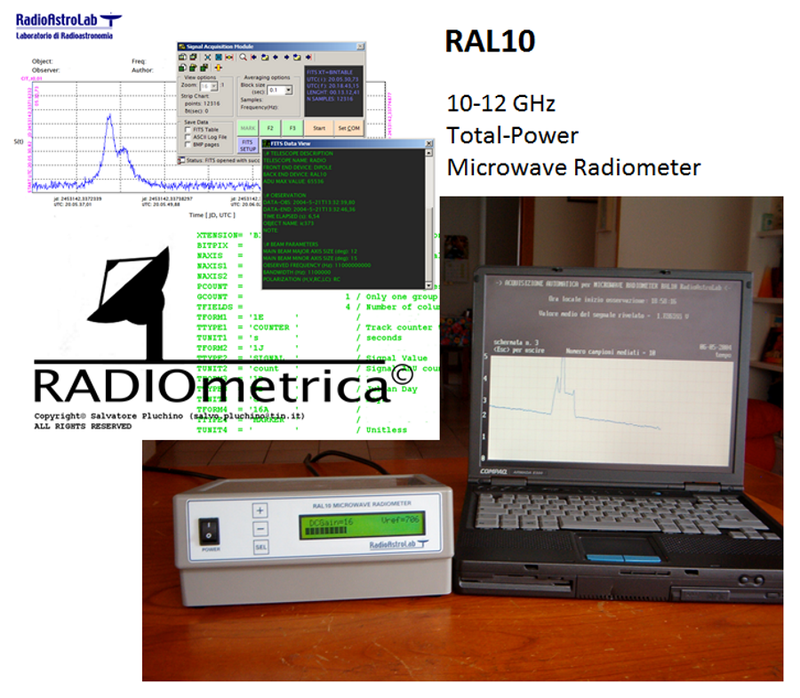 Economic and designed to take advantage of commercial elements for the reception of satellite TV, RAL10 started many fans to radio astronomy. Students, amateur astronomers, radio amateurs, schools and universities, have built their small radio telescopes to start exploring the "radio-sky." We have received appreciation and new requests, gave answers and supported enthusiasts organizing events and conferences in many cities. We are happy and proud if our work and our passion have brought people closer to this fascinating discipline, contributing to the development of amateur radio astronomy. We keep going on in this direction with renewed vigor: maintaining the primary objective of the divulgation, of the economy and ease of use, RAL10 has become a complete family of products that meets the demands of the passionate and allows everyone, absolutely everyone , to learn about radio astronomy through the construction, installation and operation of a small telescope. We always chose the experimental approach way: experience has taught us that the best is to record the radio waves coming from celestial objects with a "homemade" tool. Of course, we cannot expect the performances of great research telescopes, incomparably larger and more complex. However, the construction and installation of a radio telescope built with RAL10 and with your own hands offers a lot of satisfaction and has great educational value. 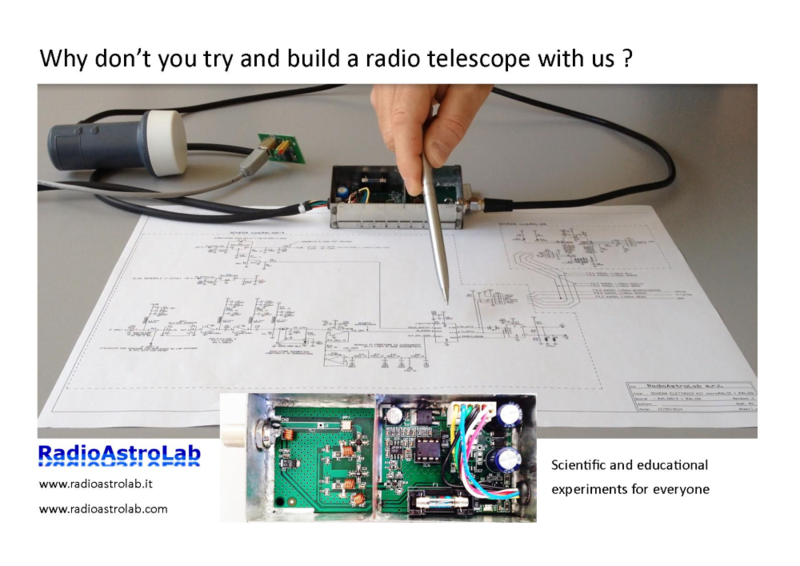 you will become friends and supporters of RadioAstroLab! We have lot of new products in progress… keep following us!